Next week, from March 8 -14, we are celebrating the delight that is children's literacy again, in the form of a blog literacy tour. Remember Share a Story-Shape a Future in 2009? Here at The Book Chook, I hosted the day about reading aloud. I was thrilled to be able to share Mem Fox's 14 Fantastic Hints on Reading Aloud, and my own and other's ideas centered around that theme. This year, the theme for the whole tour is "It takes a village to raise a reader." I've been thinking about that and will bring you my thoughts about what it really means tomorrow. Meanwhile, here is a run down on each day of the tour, and where it is hosted. On that day, hosts will publish a list of participating blogs so you can link and read. Topics of the day will encompass the relationship aspect of helping children learn to read: parent-child and teacher-parent partnerships, literacy outreach; and libraries, to name a few. Creative literacy in all its forms (writing, art, computers) will be the topic of the day. 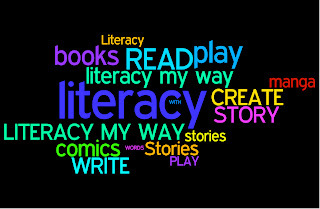 Find out how to incorporate storytelling techniques into family life, how to use multimedia to tell stories, ways to link reading and writing, reading and music, reading and art ... so many wonderful ideas for encouraging literacy in your kids. This is the day for exploring the different genres of nonfiction (biography and memoir, science, nature, math, etc), as well as the use (or not) of historical fiction. Topics include "boy books" and "girl books," as well as newer titles that fit with some classics we loved as kids. Join us as we talk about how to approach reading when your interests and your child's don't match. It may be that you don't like to read but your child does, how to raise the reader you're not, and dealing with the "pressure" of feeling forced to read. I hope you can join us for Share a Story-Shape a Future 2010! http://bit.ly/csVVXo Latest post: Share a Story - Shape a Future 2010. If you're interested in children's literacy, hope you'll join us! RT @BookChook<wbr></wbr>: http://bit.ly/csVVXo Latest post: Share a Story - Shape a Future 2010. interested in chn's literacy, hope you'll join us! RT @BookChook<wbr></wbr>: http://bit.ly/csVVXo Latest post: Share a Story - Shape a Future 2010. If you're interested in #kidlit hope you'll join us! I'm so thrilled to find you this morning through the #kidlit hashtag on twitter. I share your love of children's literature! This Share a Story - Shape a Future 2010 sounds exciting and informative. I share my love of lit every Friday by hosting a "Feed Me Books Friday" meme/carnival on my blog. I share 1-5 of some of my favorites and other moms link up their favorites as well. I love going to the other moms' blogs and copying and pasting the titles and authors so that I can look for the books at the library that week. I'm going to let others know about you special week of sharing! RT @linkstoli<wbr></wbr>teracy:@Boo<wbr></wbr>kChook: http://bit.ly/csVVXo Latest post: Share a Story - Shape a Future 2010. #kidlit hope you'll join us! Janna, I'm actually Susan, aka the Book Chook, but maybe you followed Dawn Little's tweet here? Thanks for reminding me about #kidlit - I tend to forget hashtags. I think you'll enjoy the blog tour and find so many interesting blogs through it. RT @BookChook<wbr></wbr>: http://bit.ly/csVVXo Into children's literacy and literature<wbr></wbr>? Celebrate with us, blog tour March 8-14#kidli<wbr></wbr>t #literacy GREAT! Lots of organization, Kelly, but it's such a celebration of children's literacy! I hope you'll join us! Oh! and I used to live on the island of Guam so I understand the time difference. I even visited Cairns one time. I'm coming along for the ride. Cairns is lovely. You must come back and travel further south. Good to know someone understands the time differences. I am always threatening to push Australia closer to the USA to facilitate my communication and travel needs. Sounds like a premise for a B grade disaster movie!